Acne Scar Treatment by Bellevue | Seattle's Dr. Philip Young on Ezine. We invested over 15 years to formulate our 5-7 Step process that treats all kinds of Acne Scars (ice pick, box car, rolling, elevated, discolored scars) and is done in a couple of hours. Learn More Below About the Acne Scar Vitalizer Treatment Today! Acne Scarring can make a major impact on a person's appearance and self-esteem. Often occurring during the crucial adolescent ages, perhaps the biggest significance is on one's mental health. Mild scarring sometimes can lead to tremendous psychological scars more than what is reflected in the actual physical appearance of the scars. Knowing this can help those who may have mild physical scars but yet are mentally more dysfunctional. With this knowledge it may be possible to improve on the mental aspects and sequelae from the scarring even more so than what physical treatments (plastic / cosmetic surgery, skin care, etc.) can improve. It can also possibly allow more improvement at this level just by getting the person to realize that this phenomenon is occurring. Although our treatment of this topic is more on the Physical improvement of these Acne Scars, we wanted to mention the psychological aspects to better assist people who are trying to improve their acne scars. Through our experience, even when the physical scars are improved, what lingers and usually what is more impactful is how the person responds mentally. Both the treating physician and the patient / client need to be aware of this and be able to deal with this as well during the treatment process. The Physical and Surgical Options of treating Acne Scars include more aggressive Acne Skin Care / Treatment, Microdermabrasion, dermabrasion / dermasanding, excisional procedures, subcision, volume replacement through injectible Fillers and Fat injections, Young Volumizer, Resurfacing with cO2 Lasers and Chemical peels,Face lifts, skin / tissue grafting, and Facial implants. Acne Skin care is important to the treatment and prevention of Acne. Based on scientific evidence, prevention is strongly centered on the use of Vitamin A and their analogues of this topical form of the vitamin. Retin – A is the most common. The topical treatments prevent the build-up of cells in the hair follicle (pilosebaceous unit) ultimately preventing the clogging of the pore and subsequent infection. There are anti-inflammatory properties that keep the situation from getting out of control and causing greater infection and more scarring. Salicylic acid cleansers / toners are an integral part of the skin care. Next in line with this approach is the use of oral and topical antibiotics such as clindamycin, and the cyclines (tetracycline, doxycycline, minocycline, etc.). The addition of alpha and beta hydroxy acid creams / gels help in keeping the pores disinfected and bacterial counts low. We usually suggest adding an at home glycolic peel to help keep the skin fresh and the skin turnover fast (from the usual 28 day cycle to 12-15 days). You can find out exactly what we do by following this link: Acne Topical Medications.Currrently we recommend starting with a peel on sunday, retin a on wed, and Azelaic acid 20% cream or Dapsone 5% on Fridays. More significant medical treatments consist of Oral tretinoin (Vitamin A) commonly referred to as Accutane. There are many risks with this medication but it has helped some difficult cases. Consistent after care is necessary as there can be systemic effects and consequences with being on this oral treatment. There are also some hormonal treatments that can be started including birth control pills and spironolactone act by working on preventing testosterone from stimulating the hair unit (where all the acne starts) and the production of sebum which can plug the ducts and give nourishment to the bacteria Propionibacterium acnes that cause the cascade of acne development. Through over 15 years of surgical and medical experience we developed a New, Innovative technique called the Acne Scar Vitalizer Treatment. This 5-7 process treats all variations of acne attributed scars and it is all done in about 2 hours. We have experienced better results with this one treatment than using mulitple traditional methods that are done over different times. This method is based on treating all the layers of the skin in a multilayered fashion. This is central in reversing the damage of Acne's multilayered disease process. You can learn more from the video above. Click here to learn more about the Acne Scar Vitalizer Treatment. Excision is a technique of excising the scars out and re stitching the area to try to make the scar smaller and look better. The goal is to close the area into as little of an incision as possible. The closer the incisional edges are after the closure the better the outcome. There are multiple different ways to tackle this. We like to use the Geometric line closure to improve the outcome and for camouflage purposes. This type of closure entails rearranging the scar into geometric patterns to break up the linear pattern that many scars take up. The eye and brain sees a pattern for any line that is longer than 0.7cm. So if it is longer than that you could get some benefit from geometric closure to break up the shape and randomize it so the eye and brain cannot put together that there is a scar there. A simple closure is also an option but with the above qualification in mind regarding the line being greater than 0.7cm / 7mm. Sometimes if the lesion or scar is small, you can often times incorporate a z plasty. This essentially is a simple way of breaking up the scar in such a way that it is closed in the pattern of a "Z". So the main goal of excising a lesion / scar is to make it look smaller and to help camouflage the scar better with the surrounding skin and tissue. This approach is more beneficial when the scar is significantly wide, elevated, depressed / deep, of a different texture, and more noticeable than the surrounding skin that is not scarred. If the scar doesn't have those attributes and is fairly level with the skin the better approach will be more with a resurfacing procedure like cO2 laser resurfacing, chemical peel, dermabrasion, or dermasanding. Skin Laser Resurfacing is good because it allows the skin to resurface and grow over the parts of the skin that are abraded or removed with either cO2 laser resurfacing, chemical peel, dermabrasion, or dermasanding. The abrasion and removal part removes the scarred unwanted area and allows new skin to grow over those areas. The result intended is an improvement in the appearance of the scar. Resurfacing is good when the level of the scar is near the level of the surrounding area. The greatest difference in the level of the scar and normal skin, the more the excision might be a better option. Resurfacing is a great option to do after the excisional procedures. Resurfacing approaches can also be used for ice pick scars by causing the tissue to build under the depression to raise the scar to the level of the surrounding normal skin as well. This is done with 80% trichloroacetic acid and other strong chemical peeling agents and the use of a pointed instrument, (toothpick, etc.). This same approach can be done with lasers directed to the depths of the ice pick scars and through repeated passes. Dermabrasion and dermasanding is a process where you use a rotating wire brush and sterilized sandpaper, respectively, to progressively take away the layers of the surface skin. All resurfacing works the same, you apply each method to take down the layers of skin to eventually allow new skin to resurface the area and create the beneficial effects in the process. Fillers are another choice for depressed scars through their action of filling under the depression and raising it to the surrounding area. Fillers are usually temporary like Restylane® (6mo – 1 yr), Juvéderm® (6mo – 1 yr), Radiesse® (1 yr- 2 yr), perlane (9mo – 1 yr). There are times when the fillers allow tissue to grow in place of the filler as they get metabolized. This is a minimally invasive way to get improvement to acne scars and attractive to some because of the quick recovery. 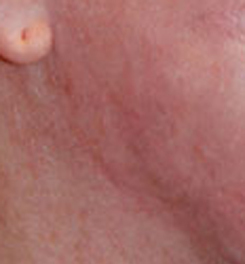 Fat transfer role in Acne Scarring? Fat injections / transfer are a great option for improving Acne Scarring. By harvesting fatty tissue from another part of your body and then injecting it into your face can do many important things for the scarring caused by Acne. Through Acne, the scarring can be pervasive and present through all layers of the skin. It can be on the surface of the skin which is easily seen. It can also be under the skin which is not as easily seen. 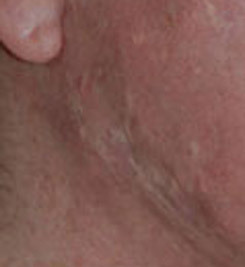 The scarring decreases the vascularity to the area over time and so the health of the skin. This makes healing from treatments more difficult as well. The scarring and decreased vascularity makes the excisions heal less well along the incision lines. It also makes it harder to achieve a better closure. A better approach can be fat injections prior to more invasive scar revisions such as excisions. The fat injections also break up the scars to allow the depressed scars to become released and increasingly raised to the level of the surrounding tissue and look better. The fat injections also bring stem cells and this brings some rejuvenative potential to the scarred skin to help it heal. From a physical standpoint, the layer of tissue allows the skin a break from the muscle movement. The cells in the skin, which are continually remodeling the skin, will remodel and reconstruct the skin now with the rest from the muscle movement and continual stress from this association. A facelift / face lift is an option to improve acne scarring by decreasing the amount of skin in the area of the face. This is the simplest way to convey the reason that a facelift can benefit acne scarring. As you age, the face loses volume and due to this you will have more skin per area of tissue (facial skeleton and deeper tissue). This extra skin will allow the scars to become deeper by simple extra skin folding into the scars. This will also allow the scars to conglomerate to make them bigger from a bigger picture. Facial implants fit into this category of volumizing to improve acne scarring through the same principle as a face lifts and fat injections / grafting. The extra skin is taken up and the scars are pushed out more and stretched out more to make them look better. Other options include Subcision and variations of this idea. This can be done with a needle or cannula placed into the skin through a very small entry site. The needle is then advanced under the scar depression and manipulated back and forth to cause future scarring underneath to raise the scars up and improve the depression. This is ideal when there is a large area of depression. Doing this surgery, you can avoid excising large areas of skin and the attendant risks that this involves. The other way to do this is through fat grafting added with the subcision to add volume with fat instead of future scarring. In this setting, the fat serves to lift the depression up to the normal level. Subcision can also mean cutting the depressed lesion and elevating around the edges to allow it to heal in the more raised level. The uplifted scar is then closed to the surrounding area and just this process can make the scar look a lot better. There are other options that have been mentioned such as fraxel, Deep Fx and other lasers that work on tightening the deeper layers of the skin. All of these layers bypass the surface and heat up the deeper layers. The intent is to cause tightening in the deeper layers to get improvement in the scars. Intense pulse light which is concentrated light, filtered light, has also been touted to help. Of these options, intense pulse light is likely to get you the least results. Fraxel and the other lasers can get you some improvement although subtle to moderate in terms of degree. co2 laser resurfacing can also carry out the deep dermal heating and tissue tightening as the other lasers. Deep fx by Lumenis can do this and get the same and more results that the other deeper tissue heating lasers. This can help the acne scarring. However more traditional means of cO2 laser resurfacing gets better results. Combining these Acne Scar Treatments is another way of optimizing results. We have found the best approach is through stages where 1.) fat grafting is the first thing started 2. then subcisions, excisions, deep chemical ice pick peeling 3. the last stage is carrying out the co2 laser resurfacing with dermabrasion for the deeper scarred areas. We combine dermabrasion dermasanding to bring the resurfacing to a deeper layer in a more controlled fashion. Acne Treatment for scarring is a challenge but improvements in your scarring can be done. Patience is a virtue. Realistic expectations are a must. The key word is improvement and not perfection. Psychologically, it may be helpful to get some evaluation in the mental effects that the scarring has brought to the patient. This part of the healing process can play a major role in getting people who have suffered from acne scarring the confidence they need to know that much of their experiences and the way they feel about themselves may not be from the acne scarring.